"With stunning seaside vistas, fountains, statues, vineyards, ancient streets and hillside churches, the rich flavor of the Italian countryside echoes through Johann Sebastian Bach's passionate and moving music." DVD International has launched an interesting marriage of classical music and travelogue in conjunction with the Naxos music label. Naxos is well known to classical music fans as the budget-priced CD line that features modern recordings with less well-known, but quite talented soloists and ensembles. While much of the Naxos CD line focuses on lesser-known works, these DVDs, at least initially, feature some of the best-loved classical works in the standard repertoire. 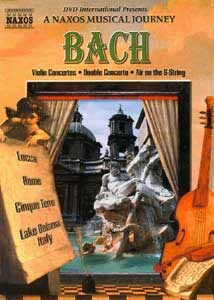 Bach features scenery and architecture from the Italian countryside, set to Bach's Violin Concerti in E major and A minor, the Double Violin Concerto, and the famous Air on the G String, from Orchestral Suite No. 3. The visuals form a very nice match indeed to the mood of the music; the opening Allegro of the Violin Concerto in E is depicted with bright, sunny exteriors; the Adagio is by contrast set in Roman ruins, shot on an overcast day, so that many times the ruins are primarily visible in silhouette. The performances are at minimum capable throughout, and are often excellent. The best portion is the jaunty Vivace opening to the Double Violin Concerto, where real enthusiasm shines through. A modern orchestra is used, so purists may dislike this effect. However, the music comes through very nicely and there is little to complain about. The running time is per the keepcase; the time function is disabled for no good reason. Image Transfer Review: The fullframe image is excellent throughout. The visuals are eye-popping from start to finish; the blues, greens and golds fairly jump off the screen. There are variations in picture quality throughout, but those are clearly intentional to reflect the music, such as the dark lighting on the slow movements and the softness in certain sections where there is a light fog on the ground. The sites are well selected for their picturesque qualities and are uniformly pleasing. There are several sunset scenes that are simply breathtaking in their loveliness. The uncredited director of photography did an excellent job on this disc. Audio Transfer Review: The audio is presented in three versions: DD and DTS 5.1 and a DD 2.0 track as well. The DD 5.1 is quite excellent. There is activity from all speakers, but the sound is only mildly directional. The effect is rather that of being in the middle of the orchestra, rather than being in an audience at a concert. The higher level bass—say about the midrange for the cello—seems a little lacking. Compared to the 2.0 track, the 5.1 track has a great deal more presence and life to it. The DTS track is not yet reviewed. Unfortunately, there is a significant audio dropout toward the end of the first movement of the opening Allegro of the E major Concerto; the audio would have been an A- if not for that serious and quite jarring lapse. Extras Review: The primary extra is the travel notes in the menu, which give a single screen about the site being visited in each movement. Unfortunately, the menu design does not permit one to visit the travel notes and then resume the music where you left off—you must start the movement over. The design is quite obnoxious. It would have been much better to run this information in the subtitle track (there is a subtitle track, but it's empty) so one could access it while listening to the music and watching the images, or optionally not look at it. The "E-Z Menu" design touted on the box is highly frustrating and exceedingly slow. This disc is best used by playing the entire thing in one setting. To facilitate this, the disc has options for repeating the entire disc (but not a single track), and a function to shuffle the tracks. Viewers should be aware that the default is to have the repeat function "on." Since there are no chapter numbers on the display, and no titles of any kind, this can result in watching the disc a second time inadvertently. I would suggest that for future volumes the default be for the repeat to be "off" and to at least give the title of each piece on the screen briefly, as well as giving the DVD player a chapter to display. This only seems reasonable since the keepcase has the chapters numbered. Otherwise you don't know which piece you're hearing unless you've kept track of the scene changes when the picture briefly goes to black. The running time, by the way, is per the keepcase; the time function is disabled for no good reason. The disabling of so many functions and the unwieldy menu design drops the extras grade down to a C- from what would otherwise have been a C+. The one extra that is exceedingly generous here is the previews of other DVDs released by or through DVD International. These include the other six initial discs in this Naxos Musical Journey series: Handel WaterMusic and Royal Fireworks Music, Italian Festival, Mozart Symphonies 40and 28, Spanish Festival, Vivaldi's Four Seasons and Christmas GoesBaroque (baroque arrangements of carols familiar and unfamiliar). There are also previews for Video Essentials, Mars The Red Planet (which looks like a fascinating disc from this preview), EarthlightSpecial Edition, Aquaria, Tender Loving Care and More Tales of theCity. These aren't really trailers, but they do give interesting little glimpses of the discs. I just wish it were possible to play them all at once instead of having to go back to the menu and select each oneindividually. Quite good performances of excellent music, combined with splendid visuals make this disc hard to pass up. Very much recommended for fans of travelogues and classical music. Just remember to set repeat to "off" and keep your menu navigation to an absolute minimum.